Chow Down Seattle: BLOGGER NEWS: Happy Anniversary Semi Sweet Designs! BLOGGER NEWS: Happy Anniversary Semi Sweet Designs! Happy Anniversary, Semi Sweet Designs! It was one year ago this month that my friend Mike, who is an amazing cookie maker and designer, started blogging about his awesome cookies! Over the past year, Mike has created some amazing cookies. To thank all of the people who have supported him over the past year, he created "Golden Girls" cookies to thank everyone for "being his friend". 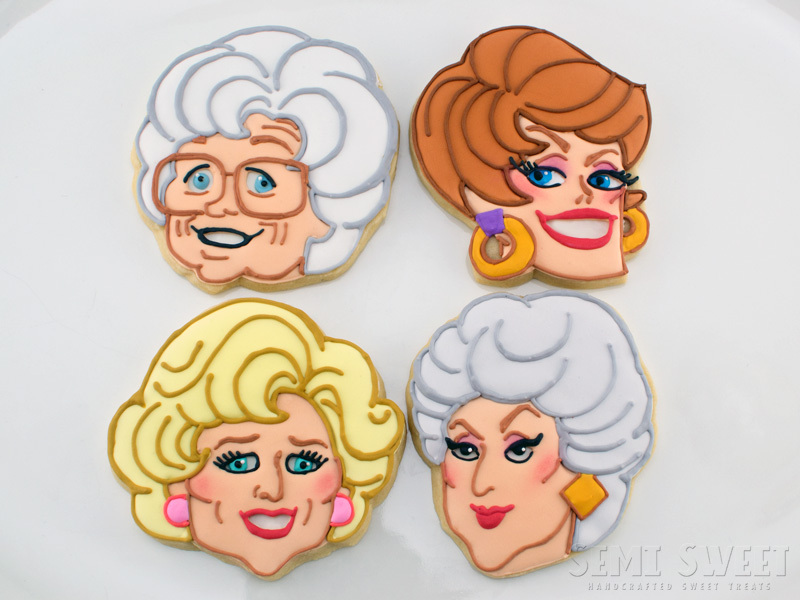 Below are the cookies he created of each of the Golden Girls: Sophia, Blanche, Rose and Dorothy. I can't overstate enough just how amazing Mike's cookies truly are. You have to check out his blog at Semi Sweet Designs to see all of his other great cookie creations! Congrats, Mike! I wish you all the best in the years to come with Semi Sweet Designs, and thank you for being a friend!